The word Plantagenet derives from the French plant 'genet' and a spray of this broom blossom was worn by King Henry II in his cap. This nickname became "Plantagenet;" which became a kind of surname to the kings of England. Henry Fitz-Empress was the first king of the Plantagenet family, also called the House of Anjou. He followed King Stephen as King of England. A strong king who pulled down almost all the Castles that had been built in Stephen's time to gain control and power over the barons. Henry was an extremely powerful king who was lord of nearly half France. King Henry II ruled England well and made many laws. One was that, if a priest or monk was thought to have committed any crime, he should be tried by a king's judge, instead of a bishop. The Archbishop of Canterbury, Thomas a Becket, refused to consent to this law. Thomas a Becket and King Henry II had once been great friends but this refusal led to their argument. King Henry was so angry with him that Thomas a Becket was forced to leave England, and take shelter with the King of France. Six years passed by before a temporary reconciliation was made. The archbishop realised that the king still hated him. Just after his return, Thomas a Becket laid under censure some persons who had given offence. They went and complained to the king, and Henry exclaimed in passion, "Will no one rid me of this turbulent priest?" Four of his knights who heard these words set forth to Canterbury. The archbishop guessed why they were come; but he would not flee again, and waited for them by the altar in the cathedral, not even letting the doors be shut. There they slew him. King Henry was devastated by this act which had been prompted by his own words. After three years King Henry showed his penitence by entering Canterbury Cathedral barefoot and knelt before the tomb of Thomas a Becket. The penitence continued with every priest or monk in turn to strike him with a rod. Whilst the dispute with Thomas a Becket was going on, the Earl of Pembroke, called Strongbow, one of Henry's nobles, had gone over to Ireland and obtained a little kingdom there, which he professed to hold for King Henry. The Kings of England became became Lords of Ireland, though for a long time they only had the Province of Leinster, and were always at war with the Irish around. Henry was a most powerful king; but his latter years were very unhappy. His wife was a difficult woman, and her sons were all disobedient and rebellious. Once all the three eldest sons, Henry, Richard, and Geoffrey, and their mother, left the court, and began to make war upon him. King Henry was much stronger and soon forced them to submit. Queen Eleanor was incarcerated in a strong castle in England as long as he lived. Her sons were much more fond of her than of their father, and they thought this usage so hard, that they were all the more ready to break out against him. 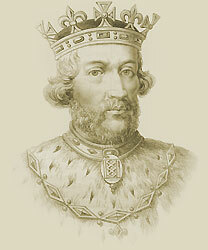 In 1170, his eldest son Henry ( known as Henry the Young King) was crowned king of England as Henry III. Historians know him as Henry "the Young King" so as not to confuse him with the later king of this name who was his nephew. The battle between father and son raged on when Henry, who was leading an army against his father, when he was taken ill, and felt himself dying. He sent an entreaty that his father would forgive him, and come to see him. But the young man had so often been false and treacherous, that Henry feared it was only a trick to get him as a prisoner, and only sent his ring and a message of pardon; and young Henry died, pressing the ring to his lips, and longing to hear his father's voice. Geoffrey, his third son, was killed by a fall from his horse, and there were only two sons left alive, Richard and John. News came that the Mohammedans in the Holy Land had won Jerusalem back again; and the Pope called on all Christian princes to go on a crusade to recover the Jerusalem and the Church of the Holy Sepulchre. The kings of England and France, young Richard, and many more, were roused to take the cross; but while arrangements for going were being made, a fresh dispute about them arose, and Richard went away in a rage, got his friends together, and, with King Philip of France to help him, began to make war on King Henry. His father was feeble, and worn out, and could not resist as in former times. He fell ill, and gave up the struggle, saying he would grant all they asked. The list of Richard's friends whom he was to pardon was brought to him, and the first name he saw in it was that of John, his youngest son, and his favourite, the one who had never before rebelled. His heart was broken and in the year 1189, Henry II died. Interesting facts and information with a short biography about the Medieval Life, Times and history of King Henry II. Additional useful details, facts, history, biography, timeline and information about the lives of all of the Medieval Kings of England and the important events which occurred during their times, can be accessed via the Medieval Life and Times Sitemap. The content of this article on Medieval life and times provides free educational details, facts and information for reference and research for schools, colleges and homework for history courses and history coursework.